Filter media, are an essential part of maintaining good water quality in an aquarium. They help remove excess pollutants and raise water quality. Often media are simply placed in filter bags, this leads to channelling where all the media does not come into contact with the water. Leaving its full capacity unused. Nyos has developed the innovative TORQ system reactor as a simple and elegant solution to the problem of aquarium filtration. 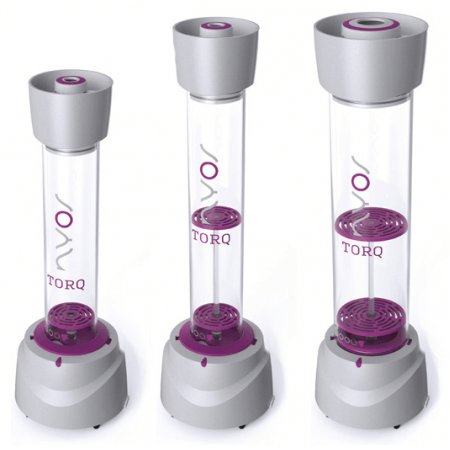 The TORQ produces an even water flow throughout the chamber giving ideal conditions for any choice of filter media. The advantages: Modular: The Nyos TORQ is an innovative system reactor for all types of filter media. The TORQ Dock is equipped with an integrated pump and constitutes the base unit. The Dock is equipped with a universal connector, which allows TORQ reactor bodies of all available sizes to be inserted. Frustration-free: With the Nyos TORQ, we have deliberately avoided screws, hoses and valves. Allowing, filter media to be changed in seconds with ease and free of frustration. High capacity: The pump in the TORQ Dock has a high maximum flow rate of up to 1.000 l/h (264 gph). Allowing filter media to be optimally utilized and preventing channeling and inefficient use. Two-in-one: One reactor, two media - In the TORQ bodies 1.0 and 2.0, it is possible to use two different filter media at the same time by inserting a chamber separator. Plug-and-play: The required pump is already included in the TORQ Dock. Simply place the body with the medium on the Dock and insert. Done.